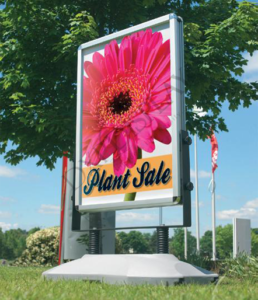 Outdoor Banner stands are ideal for advertising your business at trade shows, conferences, and for promoting sales in storefront and sidewalk. The Poster Display Stands are stable enough to withstand adverse weather conditions, snow, rain and heat throughout the year. Outdoor banner stands consist of front-loading picture frames made of high quality aluminum and powder-coated steel that are weather-resistant. The Poster Display Stands allow companies to change graphics and information as and when required for maximizing promotion in a cost-effective manner. The multi-purpose banner or display stands are easy to set up and includes clear sign cover for local advertising.